For any website to be functional or effective, every element from the header to footer plays a big role in making the overall website informative and usable. Footer is a great place that gives store owners an opportunity to direct their customers (or users) to different parts of the sites or add contact information so that they can be easily reached. A lot of users are not aware that nopCommerce comes (out of the box) with a plugin that can be very helpful to store owners. A plugin (if enabled) can sent you message notifications on your mobile phone when you receive orders, message or any important updated in regard to your store site. Many search engine optimization (SEO) experts have different opinions about where to place Google Analytics script. Whether it should be in <head> or </body> section? If you search online, you will find several different opinions from different SEO experts / developers. In nopCommerce (out of the box), the Google Analytics script (if enabled) is designed to be placed right before your </body> tag. But, there are some users / developers who prefer to place the Google Analytics script in the <head> section. So, let us go over the process if you wish to change the placement of your Google Analytics script from </body> to <head>. Today, we will discuss, how to manage locale string resources of each store for any published language. 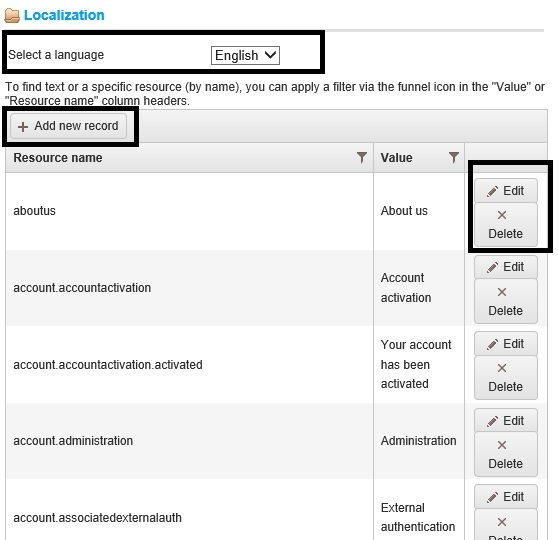 The benefit of using locale string resource is that if you have multi-store or if you allows your customers (or users) to view your store site in different languages, you can easily set up a resource string with its value and based on the language, it will change automatically instead of you saving each languages text as hard code. n nopCommerce, when as a store admin you start adding product categories in the database (via administrator section), you will notice that all the default links like "Home", "New Products", "Contact Us" etc are replaced with main categories of your products. How can you change it back to the original menu items and not show the categories tabs? Today, having forums (or discussion boards) on your e-Commerce website is a great way to providing an option to your customers to communicate with you (as an online business). CMS features like online forums gives a chance to the customers to participate and engage in conversions. These conversation acts as a quality content for your e-Commerce website and hence provide quality content for SEO (search engine optimization). Today, we will go over the process of creating forum groups in nopCommerce. As an online store owners, you have to manage a number of settings on your e-Commerce store. One of the important thing in maintaining an online store site is configuring weight and dimensions of the products / items that you are setting as shipping cost is calculated based on what you have saved in your database. Today, we will go over the process of adding and editing the weights and dimensions in the default system as well as setting the primary weight and dimension used in nopCommerce.